In 1987 Joe Satriani became an endorser of Ibanez guitars. 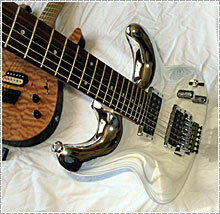 10 years later in 1998 Ibanez released the JS10th (aka Chrome Boy/Chromeboy) to celebrate a decade long partnership with Joe. These guitars are now the most sought after guitars made by Ibanez. 506 JS10th's were produced in total and there are a handful of Chromeboys that were refinished by Ibanez and recorded as 507(N), there are at least 4 of these with 507b being registered right here and one documented as being unstamped. The original numbers of these Chrome boys are unknown. In 2005 the JS2PRM was released, basswood covered in aluminium. The finish is less bright than the chrome, but just as magnificent. There was an initial run of 20 and in true Chromeboy style, the finish had issues. Later in 2006 the remaining promised 40 have been produced (making a total of 60) and are on the market. For more history on the JS10th Chromeboy, please visit the links section.